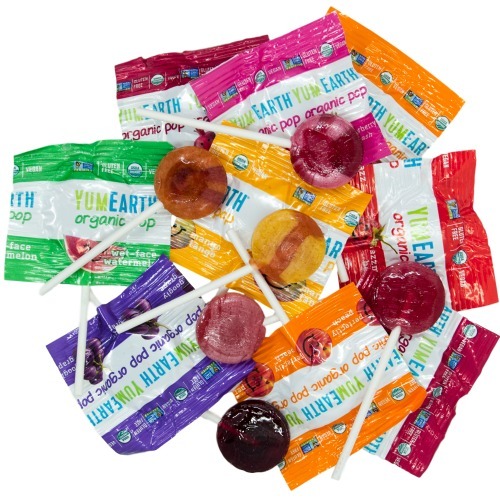 YumEarth organic lollipops! Mix may include: pomegranate pucker, wet-face watermelon, strawberry smash, googly grape, very very cherry, perfectly peach, razzmatazz berry, mango tango. Ingredients: Organic cane sugar, organic brown rice syrup, non-GMO citric acid (from beet sugar not corn), ascorbic acid, natural flavors,colored with organic concentrate (carrot, apple, blackcurrant), turmeric (color), organic annatto (color). From the package: Facility does not process any of the eight major allergens (peanuts, tree nuts, wheat, milk, egg, soy, fish, or shellfish/crustaceans). GLUTEN FREE, Vegan, NO Peanuts, NO Tree-Nuts, NO High Fructose Corn Syrup, Made in a Peanut-Free Facility, Made with NO Soy, NO Egg, NO Dairy. Misc. info: Citric acid is from non-GMO beet sugar. Product is Non-GMO Project Verified. Approximately 66 lollipops per pound. What is the actual size of the lollipop? Compared to a dum dum or a Blow Pop? Owner Response: Hi Jen, The YummyEarth Lollipops are more of a flat oval shape. They are about 1 inch in diameter and a .25 inch thick. Please Let us know of any other questions. We bought these for the first time after throwing out all of our candy that had food dyes. The kids love them, but our bag came with mostly cherry flavored suckers. We would have liked more of an even mixture. They fought over all of the other flavors because there were only 1 or 2 of each and the rest were cherry. We've been getting YummyEarth mixed lollipops for a few years now. They are a favorite for our family! We're "that family," though--the organic, natural one. So I tried them with our mainstream friends: kids, teachers, neighbors. So many say they are the best they've ever had! Just tried these pops and they are amazing! the flavor is really intense, a bit tart, sweet but not overly so. Perfect size, too. Love them! They are good, but a little too sour for me. I like a sweeter candy. If you like sourish candy, this is for you.